Montréal, Canada, 2017-Mar-30 — /Travel PR News/ — Bombardier Commercial Aircraft confirmed today that a C Series aircraft with a representative payload successfully flew non-stop from London City Airport (LCY) to John F. Kennedy (JFK) Airport in New York City. 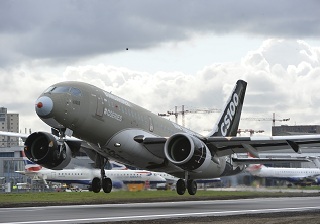 The direct intercontinental flight followed a series of successful flights to demonstrate the CS100 aircraft’s exceptional capabilities for operations to and from LCY, including steep approach landing and short runway performance. “It has been a pleasure to welcome the Bombardier CS100 aircraft and its team to London City Airport for the first time, as part of their testing and evaluation process. Following the landmark C Series non-stop flight to JFK, we look forward to the completion of its regulatory certification, followed by entry into commercial passenger operation with SWISS,” added Declan Collier, CEO of London City Airport. This entry was posted in Airlines, Airports, Flights, Transportation, Travel and tagged Bombardier C Series aircraft, Declan Collier, John F. Kennedy Airport, London City airport. Bookmark the permalink.